After a really interesting morning of Networking with the Nuneaton and Bedworth Business Support Expo, I really wanted to share with you several reason why I personally think Nuneaton is a lot more appealing in terms of property investment than people realise. Speaking at the Expo were Terry Spall, Commercial Director for MIRA Technology park Ltd on the A5, As well as Lisa Garley Evans, General Counsel and Chief Compliance Officer at Holland Barrett (Head Office in Nuneaton) amongst other very informative speakers on the regeneration and improvement of Nuneaton as a whole. Both Mira and Holland Barratt are International companies, and are literally on our doorstep! Both companies have had Billion pound investments in order to expand further, meaning, more and more jobs are being generated for the area! Currently Holland and Barrett have 60 jobs available at their head office, and in the past few weeks held a job expo where over 200 people turned up interested in working for them. 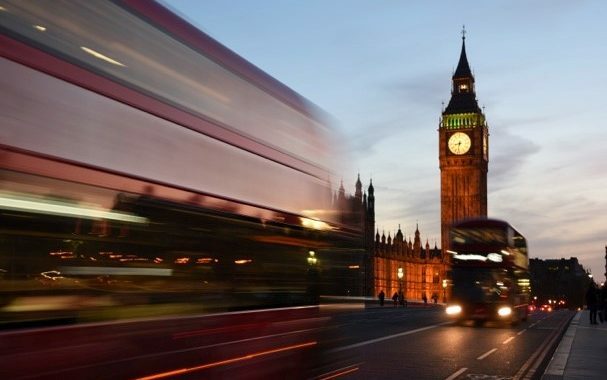 MIRA and H&B alike will have jobs suitable for local people and also people looking to relocate, even those who are currently commuting from places like London will soon see the sense in Moving to Nuneaton simply for the cost of living being substantially less! 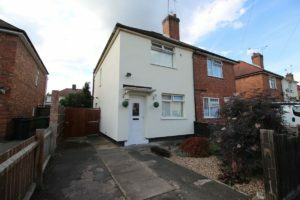 This aside, Nuneaton will always be a hot spot for renting, especially your typically 2/3 bedroom terrace property- they will never have large void periods, ( experience tells us this) but people with slightly more desirable properties or those looking to invest in similar properties shouldn’t be deterred. There are re-location agents who contact us regularly asking us to keep them informed of these types of properties for tenants who will be moving from all over Europe just to come and work in a specialised field at companies such as MIRA. Again, experience has shown us that said properties have never been an issue to rent out – families/working professionals and relocators alike seeking 3/4 bedroom semi detached family homes in the more affluent areas of Nuneaton. If you are looking to invest, or similarly have rental properties in Nuneaton, please feel free to give us a call or pop in and see us on Bond Street. We are always happy to meet like minded people. Property is a great game to be in, but…you have to be in it to win it!! We, at QT Homes, have now gone into sales! 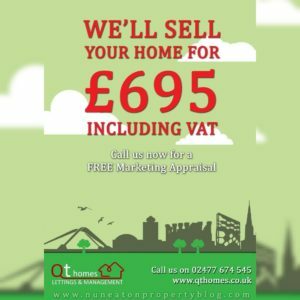 We will sell your home for £695. 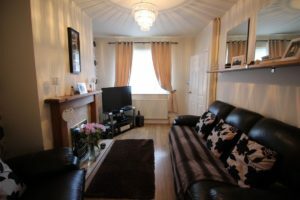 Melissa and I are delighted to let you all know that we have now also gone into sales as well as lettings! It was a natural progression for us and our business- QT Homes- and since we started a few weeks ago we have already successfully marketed and sold 2 properties, and are currently marketing our third property in Bedworth. We cover Nuneaton, Bedworth, Hinckley and this side or Coventry, as well as Atherstone and surrounding areas. If you, or anyone you know, are interested in Selling their property, we do offer a £50 recommendation (upon completion) to anyone you pass our way. It couldn’t be easier. Just give us a call and we can talk you through what we offer. Our sales package is £695(no VAT) which is paid upon completion. We look forward to hearing from you and offering you our friendly, professional service. Fancy a 2 bed Semi in Bedworth with a 6.8% yield? We’re spicing things up a little today showing you a property in Bedworth as apposed to Nuneaton… 1, because it really isn’t a million miles away and 2, as many of you are aware there doesn’t seem to be much on the market in Nuneaton at the minute. Melissa has done a short Video to talk you through the property, we hope you enjoy! Oh my, oh my, if I had a fiver for every landlord we’ve had on the phone or in the office, drowning their sorrows (in a lovely cup of tea that I made) over the recent tax changes as well as tenant fee ban and anything else the government has thrown at them in the last year or so, I would be sunning myself in Barbados right about now instead of writing for you lovely people. Those of you who are familiar with the blog will know what super fans we are of investing in property and how, we believe, there’s no better place to invest your well-earned pennies. For a long time now the buy-to-let market has yielded fantastic returns for all those brave enough to take the leap into the world of property investment and it has beaten all major asset classes in the last five years, hands down! Yes, I know the Government have gone all psycho loco on Landlords and think that we’re the Devil but, despite the tax changes, investors will still be able to gather pretty good returns. Yes, the days of 7+% yields may be out the window but, according to research carried out by the Centre for Economics and Business Research (who did research into the BTL market on behalf of UK retail and Commercial bank), you’re still looking to get a pretty healthy return so, do not despair. Word on the grapevine is that the biggest gains for investors will be from profitable growth and it predicts that the UK home average price will have increased by 59% by 2027 against 2016’s level. You may think 2027 is far away but, it’s only 10 years! You may have a few extra grey hairs and wrinkles but you’ll be able to spend the profit from your investment on rectifying those physical signs of aging and have plenty left over. Not only do you get a good profitable growth, you also have an increased demand in tenants to look forward to. It’s estimated that private rented residences will rise from 21% (2016) to 28% by the end of 2027 (The Office for National Statistics predicts the UK’s Population to rise by 4.4 million over the next 10 years reaching 70 million in 2027). Investors ask me is it safe to invest in property. The analogy I use is that if you were to go to your bank for a loan, they would go through the formality of asking you what it was for. If you then proceed to tell them it was to buy stocks, in the stock market there probably going to smile politely, tell you they can’t help and then boot you out the door. BUT, When you go and say you’re investing in property, they will gladly continue with you, as they know property is a safe investment for them, which is not the case with stocks and shares. If you’re prepared to ride the storm and feel strong in your position as a landlord, I say, keep going because it will be worth it. If you have any concerns or questions relating to your Nuneaton property investment(s) please feel free to give us a call. There’s no question too big or too small. If you’re finding your Nuneaton property investment stessful but you’re not ready to sell, why not give us a call and ask how we can help you manage the property for you. 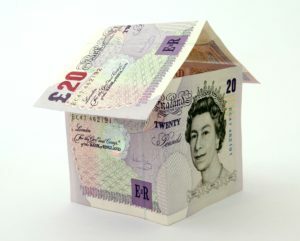 If you’re not ready to give us a call, feel free to visit our website www.qthomes.co.uk for more information. Our first question to you, if you come and see us, is “What would you like to drink”. You’re always welcome to pop in and have a chat so, make the most of it. Look forward to seeing you soon. We know that the stability and strength proposed by Theresa May might not be delivered after all. But is that really so bad for a market already in danger of overheating? 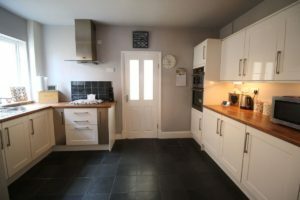 Certainly the lack of available properties for sale in Nuneaton and in general has helped to escalate prices to unsustainable levels in some areas. Are Nuneaton landlords stifling the Nuneaton property market…? Following the publication of a recent blog article about ‘Generation Rent’ a local homeowner of Nuneaton contacted me. He said that he felt that the plight of our Nuneaton youngsters (first time buyers), was that like of a novice football player trying to bend it like Beckham! You’re in a minus game playing Beckham at his own game right? Play him a 100 times and you’re bound to lose 100 times!! There is no doubt that buy to let landlords have played a major role in driving up property values in Nuneaton (and the UK) and from that made housing a lot less affordable for the 20-30 somethings of Nuneaton. Let us look at how affordable Nuneaton is. The best way to measure affordability is to measure Nuneaton property prices against Nuneaton average salary (the higher the ratio, the less affordable properties are). For example in 2014, the average value of a Nuneaton property was 5.94 times higher than the average annual wage in Nuneaton, and in 2016 the average value of property was 5.77 times higher compared to 2002 when it was just 3.98 times higher. As affordability of property decreases the younger generation find it less appealing to purchase or own their own homes instead…choosing to rent. The Tories have certainly done much to level the playing field in favour of first time buyers. For nearly a year now, landlords have had to pay an additional 3% in stamp duty on any buy to let purchases and, over the coming four years, tax rules on landlords claiming mortgage interest relief will affect their pocket. It also does not help owner-occupiers that local authorities sold off council houses in the Thatcher years. So, for many on low incomes or with little capital, owning a home has simply never been an option (today or in the past). It’s easy to look at the headlines and blame landlords. First time buyers have been able to access 95% LTV mortgages since 2010, meaning even today, a first-time buyer could purchase a 1 bed apartment in Nuneaton for around £80,000 and only need to find £4,000 deposit. Yes, a lot of money, but first time buyers need to decide what is important to them. Either, save up for a couple of years for the deposit or go and have two annual foreign holidays, get the full satellite or cable TV package with sports and movies costing three figures a month, upgrade to the latest mobile phone and go out socialising. However, as a nation did we always have majority owner-occupier tenure? 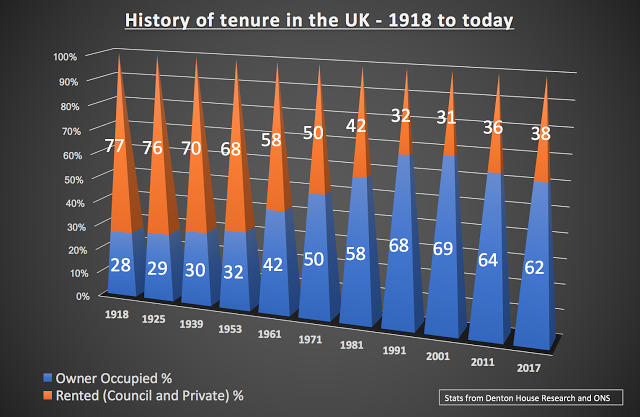 The graph below shows the history of our tenure in the UK since 1918 to present day 2017. I think we as a country have changed. Renting seems to be returning to be the norm. So, my opinion is, landlords have it tough. Let’s not blame them for the perceived woes of the nation. To be frank, we haven’t always been a country of homeowners. 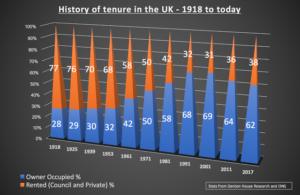 Roll the clock back to 1964, and nationally, 30% of people rented their home from a private landlord.